Enjoy the day with family and friends. (And hopefully not a hurricane!) 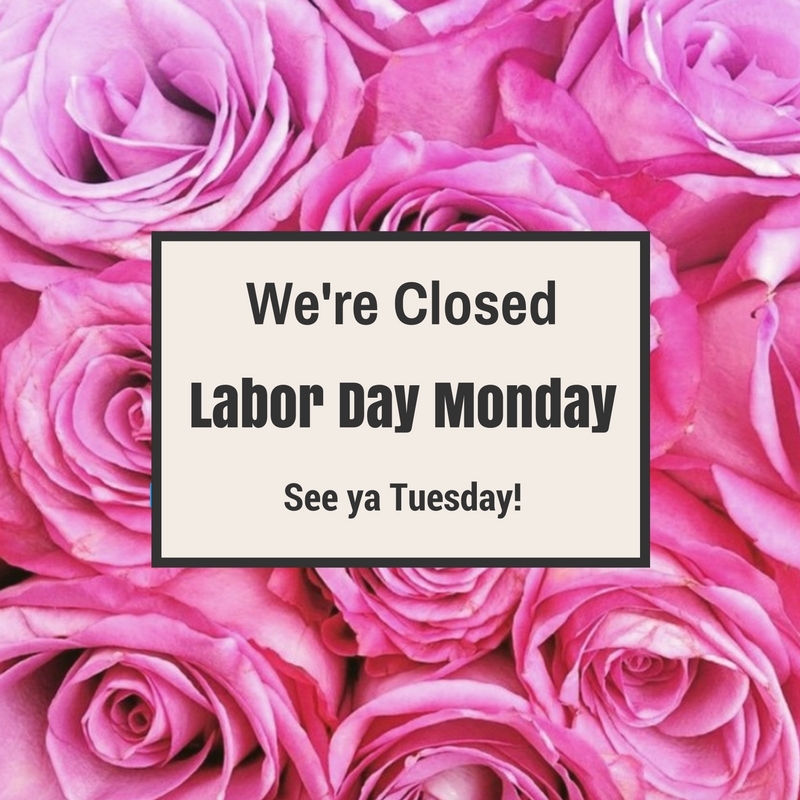 We’ll see you Tuesday! Head back to school with luscious locks! 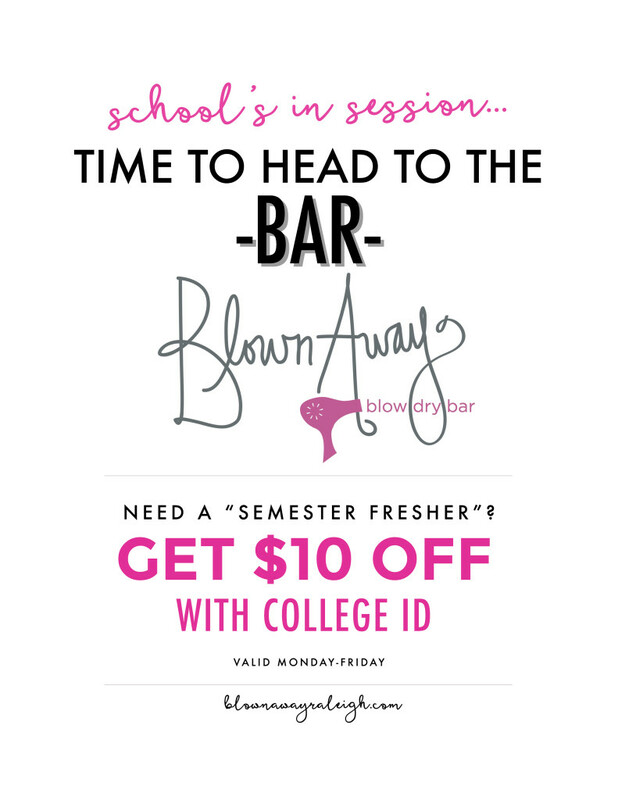 Get $10 off a blowout at Blown Away Raleigh Monday-Friday with your college ID. 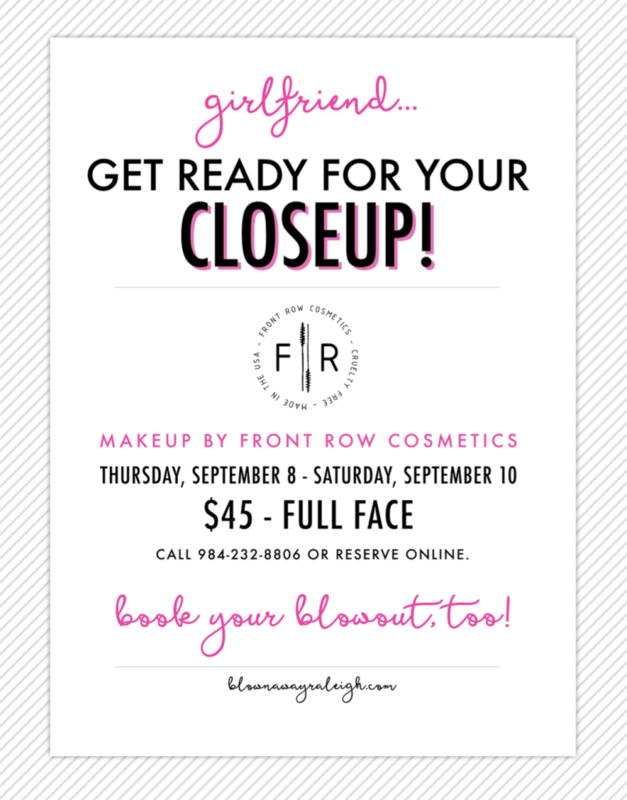 Going back to school never looked this good! We’re hosting a selfie contest this week (August 15-20th). 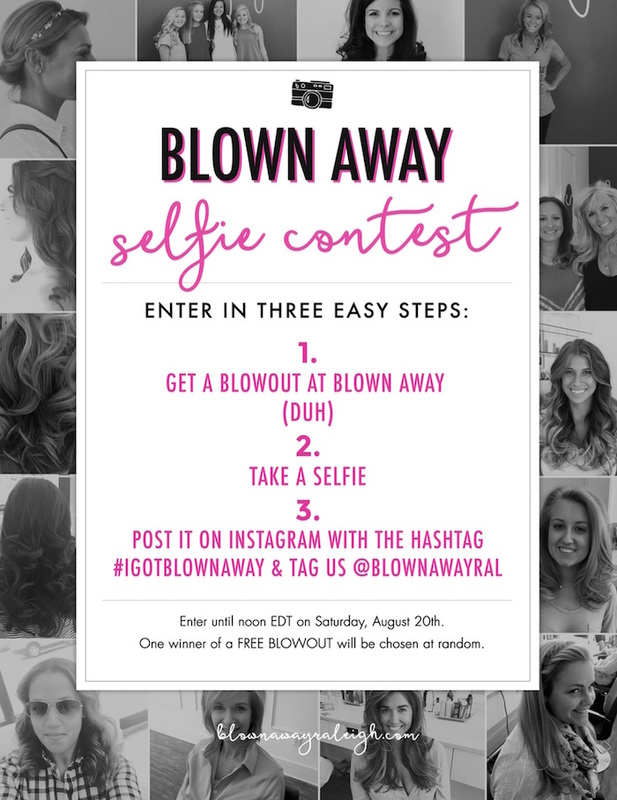 Just snap a selfie after your blowout at Blown Away, post it on Instagram, and tag us @blownawayral and #IGotBlownAway. We’ll put all the entrants in a hat and pick a random winner of a free blowout. Good luck and have fun! 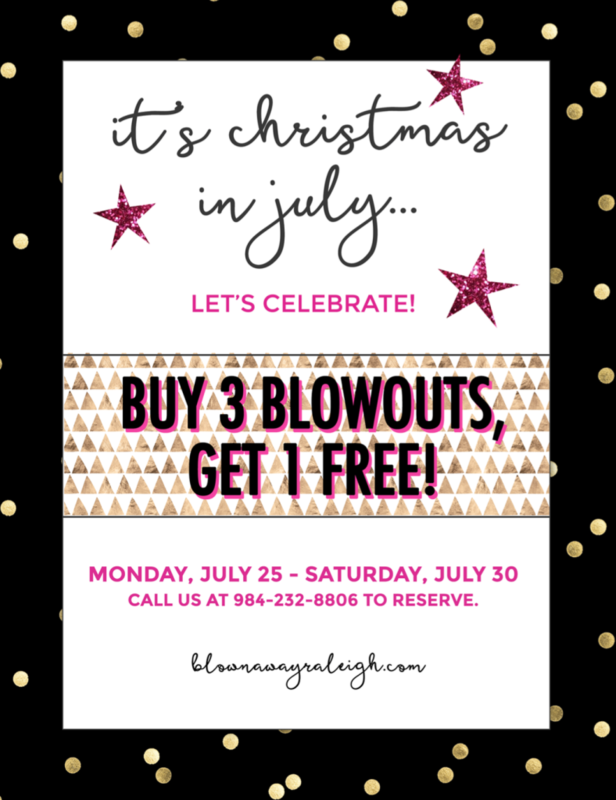 Celebrate Summer With a Splash! What says “summer” better than loose, beachy waves? 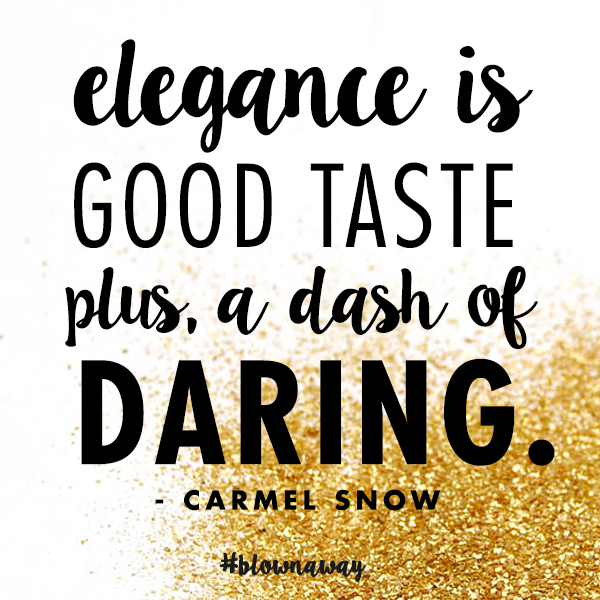 This style, that we call “With a Splash,” is one of our most-requested looks while the mercury is high, and for good reason. Its relaxed vibe is perfect for flipflops and cover ups, and will give you just that extra bit of a vacation feel while you’re stuck in the office. If you can’t be at the beach, at least you can pretend. 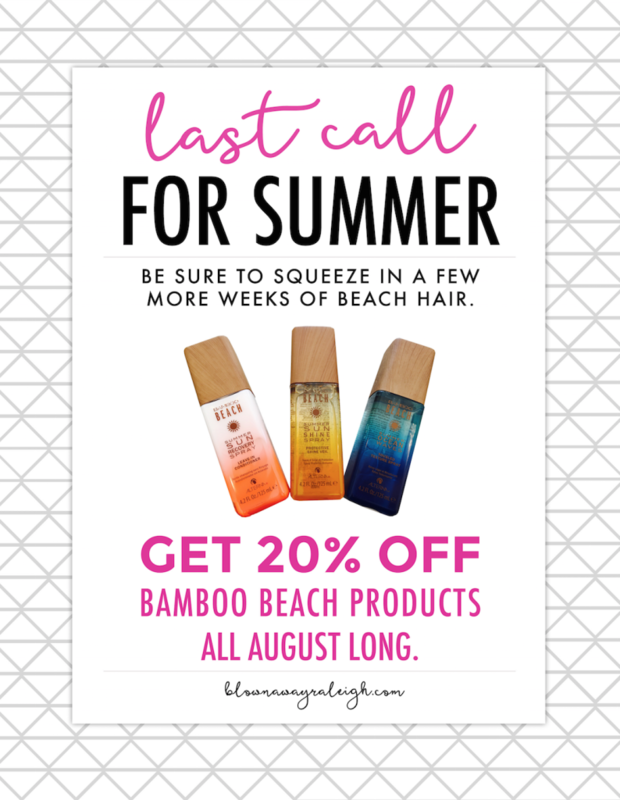 Alterna Bamboo Beach products keep your hair looking and feeling great, even during the heat and humidity of summer. 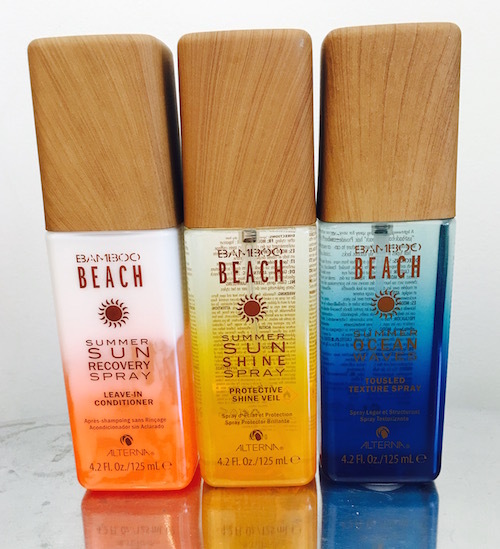 And, best of all, Kelly, our Manager, says “They smell like beach in a bottle!” All three are infused with an exotic Mango Coconut summer scent. Summer Sun Recovery Spray: A hydrating leave-in conditioner that revitalizes sun-parched hair. Helps to restore hydration to hair, making it more manageable, smooth, soft and shiny. Specifically formulated with UV filters to help combat the damaging effects of the sun, pool & saltwater. Summer Sunshine Spray: A weightless mist that instantly polishes & adds brilliant shine, while protecting hair from the sun. Specifically formulated with UV filters to help combat the damaging effects of the sun, pool & saltwater. Infused with an exotic Mango Coconut summer scent. Summer Ocean Waves: A lightweight texturizing spray that creates “just-back-from-the-beach” hair. Helps to create texture in the hair without drying, like traditional salt sprays. Specifically formulated with UV filters to help combat the damaging effects of the sun, pool & saltwater. We have all three in stock, so pick some up during your next visit to get Blown Away! 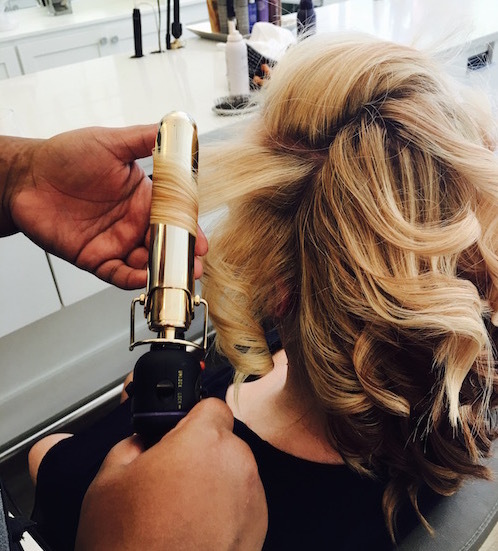 “Next we use our curling irons to put some curl in the hair for beachy waves. 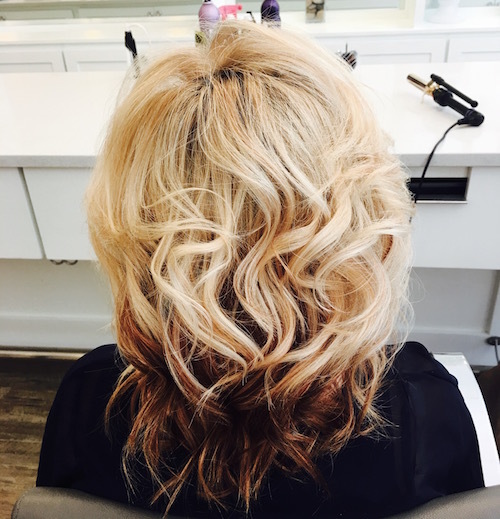 We use our traditional curling irons, but if you’re trying this style at home,” Kelly says, “it’s easier if you use a wand. You end up with less of a ringlet-type curl and more of a wave.” Leave about an inch of hair at the bottom uncurled. After adding waves to the hair, it’s time to relax the strands a bit so they aren’t quite as bouncy and curly as our “With a Twist” style. We finish off the style with a spritz of Summer Sunshine Spray for extra shine and UV protection. Voila! You’re ready to go make a splash! We’ve added a hair gallery to our website so that you can browse our beautiful blowouts and get inspiration for your next appointment! 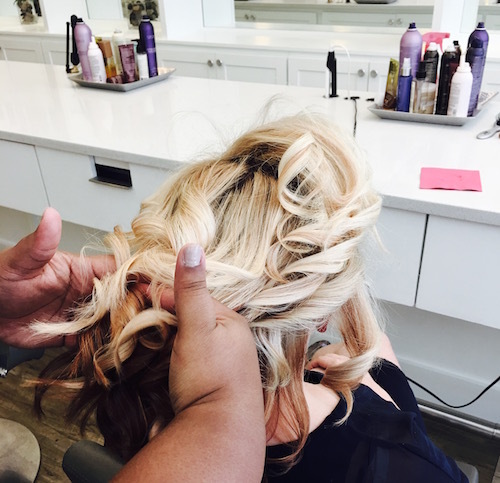 The best thing about being a stylist is: Making people feel beautiful and feel good about themselves. Favorite hair trend and how you help people rock it: Balayage and Ombre. I love to personalize every color to enhance a person’s natural beauty. I am currently listening to __ Don’t You Ever Think of Me by Corinne Bailey Rae___ on repeat. Coffee or Tea? Tea! Teavana is my favorite! Lip-gloss or lipstick? Red lipstick, please! Hollywood hair inspiration: Corinne Bailey Rae–her curls are amazing! 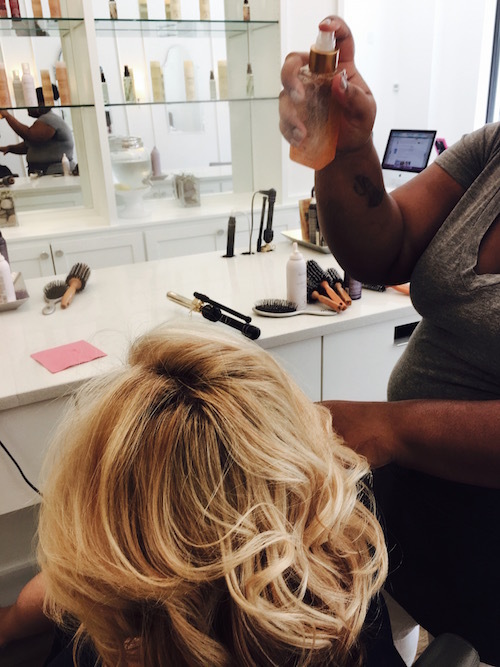 Best hair advice you can offer to clients: Love and take care of your hair! Favorite product we carry & why: Caviar Replenishing Moisture Conditioner. 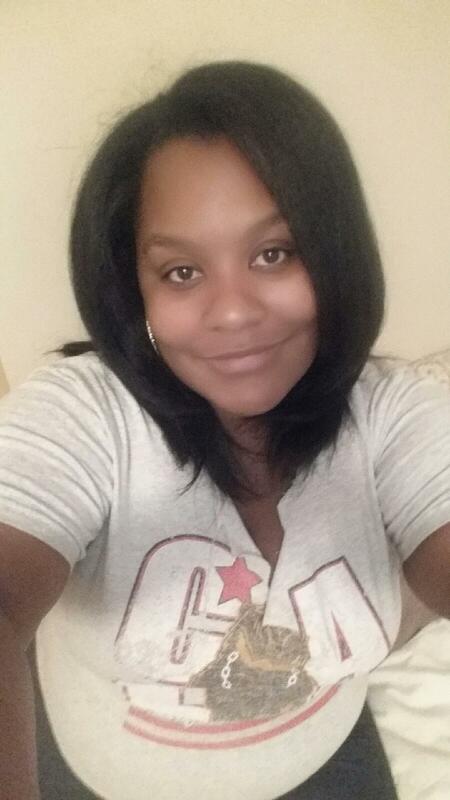 It moisturizes my curls and makes my hair more manageable.